Harold Dahmer, whose father Vernon Dahmer was killed in 1966 by the Ku Klux Klan, smiles when he sees a photograph of his younger self on display at the Mississippi Civil Rights Museum. Museum personnel said the goal is to take visitors through the darkness of the past into the light they hope for in the future. Museum exhibits, including one on the assassination of Medgar Evers, take visitors through significant events that drove the fight for civil rights forward. 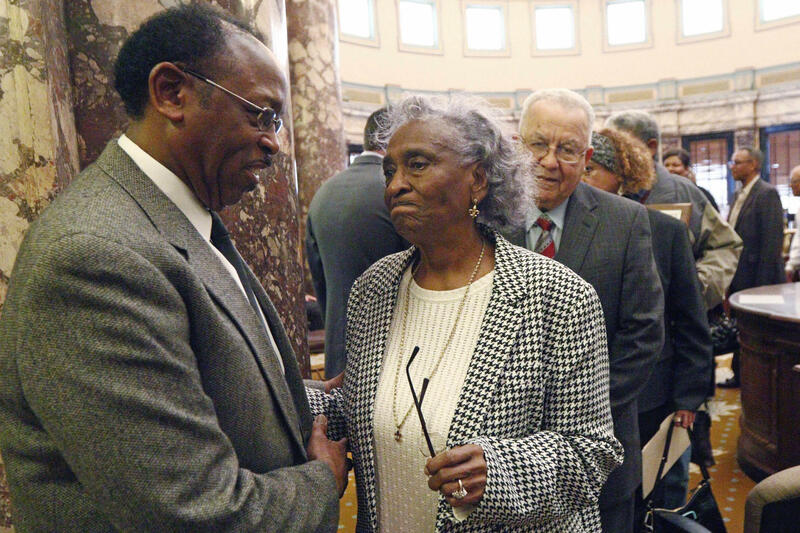 State Sen. Albert Butler Sr. speaks with Ellie Dahmer, the widow of NAACP leader Vernon Dahmer, who died when the Ku Klux Klan firebombed their home in 1966. Bettie Dahmer (left), with her mother, Ellie, said her father "was simply trying to make the world better for his children and other children." 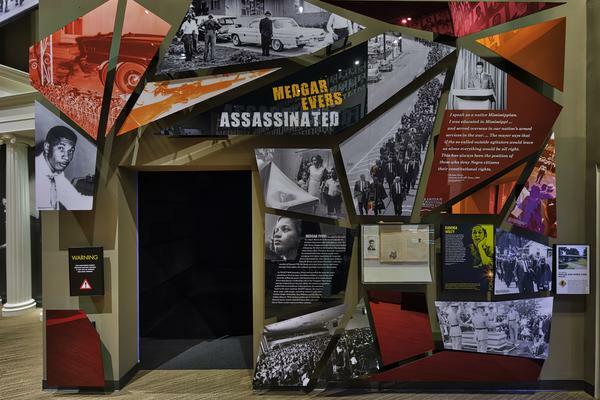 The Mississippi Civil Rights Museum opens Saturday in Jackson as a testament to the state's complicated, often dark, racial and political history. This week, it became the setting of its own political dust-up, but organizers hope to stay focused on the museum's message. Democratic Reps. John Lewis of Georgia and Bennie Thompson of Mississippi announced earlier this week that they would not attend the opening after Republican Gov. Phil Bryant extended an invitation to President Trump, who attended Saturday. Mississippi is a key chapter in the nation's ongoing struggle for equality, but the state has been slow to acknowledge the racism and violence in its past. The new museum now tells that difficult story. Pamela Junior, director of the Mississippi Civil Rights Museum, guided a group of guests through the galleries before the official opening. The tour starts with a look at Africans coming to the U.S. through the trans-Atlantic slave trade. Next, museum guests journey through the Emancipation Proclamation and Reconstruction, when African-American communities begin to thrive. Then the tour takes a turn into a room dominated by a tree with limbs sprawling overhead. "It's not only you think about the tree and lynching," Junior said. "But you look up and see the images — Jim Crow images — as leaves on the limbs of the tree." There are five lynching monoliths, etched with the names of some 600 victims. Junior wants visitors to experience these dark, cramped spaces as they move through the museum. "The [civil cights] movement was very uncomfortable," she said. "I want them to feel uncomfortable. So they can understand that once they come through this tunnel, they'll come to light." The challenge, she said, is to "make Mississippi the best that [it] can [be]." Junior said she and her colleagues will encourage visitors to travel across the state to learn more at key historical sites. And there are plenty – Bryant's Grocery store, where Emmett Till was fatefully accused of flirting with a white shopkeeper before he was abducted and brutally killed; the house where NAACP leader Medgar Evers was assassinated in his driveway; voting rights activist Fannie Lou Hamer's grave; the field where Stokely Carmichael of the Student Nonviolent Coordinating Committee first called for Black Power; and the Neshoba County memorial to three civil rights workers killed by the Ku Klux Klan during Freedom Summer. Mississippi state Sen. Hillman Frazier calls his state "ground zero when it comes to civil rights." Frazier, of Jackson, was instrumental in getting legislation passed for the new museum and served on the planning committee. It was a long time coming, he said. "Folks thought we should forget about that part of history. Don't tell the story. Don't bring up anything that is painful," he said. "But that's part of our history." Civil rights tourism has taken off in other states. 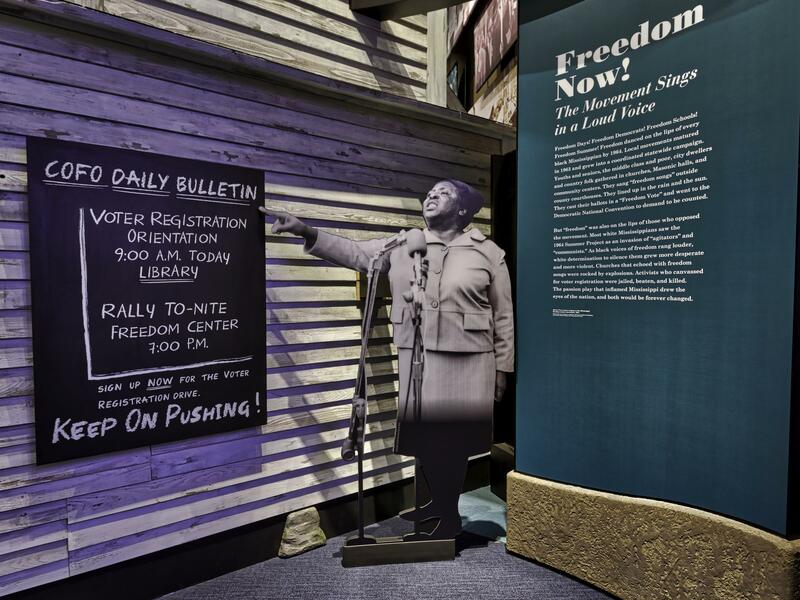 In Alabama, the Birmingham Civil Rights Institute and the Rosa Parks Museum in Montgomery are a big draw. In 2006, then-Republican Gov. Haley Barbour helped push the Mississippi project forward, seeing the economic benefit. But to secure funding from the Legislature, Frazier said, the civil rights museum was paired with a state history museum, giving lawmakers political cover to approve it. "Some just didn't want to vote for a straight-up civil rights museum because of the districts they represent," Frazier said. "They just didn't want to bring those issues up." 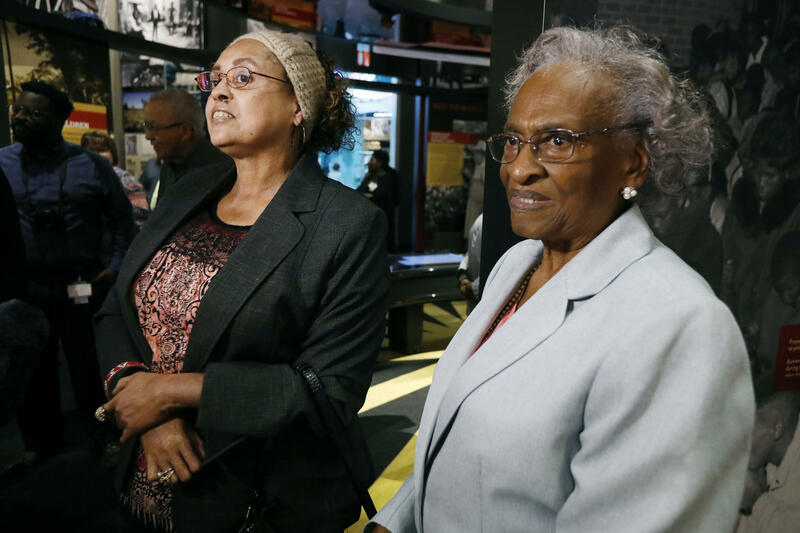 Some state officials, including Frazier, reject the idea that the dual museums represent a continuation of the "separate but equal" doctrine. Instead, he said, they complement one another. Set in downtown Jackson near the Mississippi Department of Archives and History, the two buildings are joined by a common lobby. The Museum of Mississippi History gives a broad overview of the state's past. "This museum covers the entire sweep of the state's history from the earliest times to the present," said state archives director Katie Blount. It spans from the Stone Age and Native American cultures through the Great Mississippi River Flood of 1927 to Hurricane Katrina. Blount said the civil rights museum brings a deeper focus to the 30-year period when Mississippi was at the center of the movement. Both museums tap the vast collection of the state archives, including the papers of Medgar and Myrlie Evers-Williams. But Blount said there are gaps in the broader state museum, particularly from the civil rights era. "It was a more recent period, and people don't necessarily think of what they have as artifacts," she said. "And there was also some hesitation until the museum was built and people could see the approach we were taking. I think people were hesitant to let their treasures go." Another major contribution came from the family of murdered Hattiesburg NAACP leader Vernon Dahmer. He was targeted for offering to pay the poll tax for African-Americans who wanted to vote. Dahmer was killed in 1966 when the KKK firebombed his home and surrounded it, waiting to shoot anyone who tried to escape. While her husband fought off the attackers with a shotgun from the front of the house, Ellie Dahmer busted a back window to get out with her children. The 92-year-old said she never thought she would see it documented in a museum. "We lived it," she said. "And some of them died with it. The rest of Mississippi needs to know about it." Museum director Junior showed the Dahmer family a photograph of the four oldest sons who returned from the military after their father was killed. They stood somberly by the remains of the family home. "You see the brothers all with uniforms on," Junior said. "His sons were fighting for America, and Mr. Dahmer was here in Mississippi fighting to be an American." Vernon Dahmer Jr., the eldest son, stopped to gather himself when he saw the picture. "That was a tough day," he said. "To have to come home and look at where we were raised and reflect back on the memories of growing up. And it didn't need to happen." 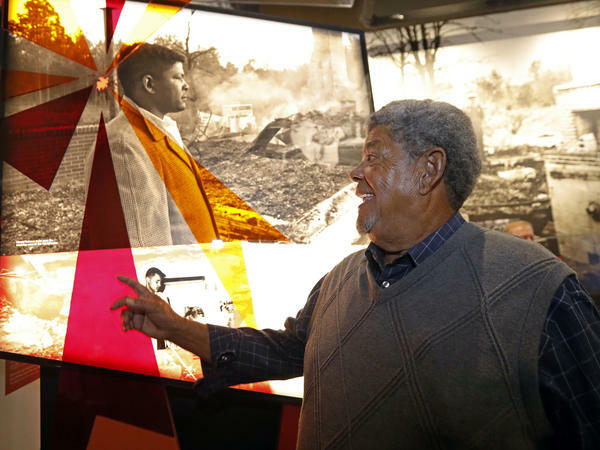 He is moved by the museum's treatment of Mississippi's brutal past. "We've come a long way, and it's something we can all be proud of," Dahmer Jr. said. "Got a long way to go." He said he is pleased and proud to see the exhibit on his father and Mississippi's other civil rights martyrs. "It represents well what Mississippi stands for and what we've gone through," he said. His brother Dennis Dahmer was 11 when the KKK attacked. He said they came to send a message not long after passage of the Voting Rights Act. "To terrorize black folks and people sympathetic to black folks," he said. "This is still Mississippi, and this is the kind of stuff that can happen to you." The Dahmers said Mississippi's state flag with its Confederate emblem sends just as chilling a message. "We can't get rid of the flag," Ellie Dahmer said. "How can they put up a museum like this?" Despite a confession from one of the Klansmen, it was more than 30 years before Mississippi convicted a KKK grand wizard for Dahmer's murder. Ellie Dahmer said it's up to white people to see it through. "If as many of them will stand as the Blacks did in '66, we will change in Mississippi," she said. "But you all are going to have to stand. We've already stood." Her daughter, Bettie Dahmer, was burned in the January 1966 attack. She's thankful for the exhibit and thinks the museum is a powerful teaching tool. But she is not so sure her dad would approve. "This is just not my daddy's thing," she said. "Accolades, no, he wasn't looking for that. He was simply trying to make the world better for his children and other children." Now, a new controversy has put Mississippi in the spotlight after Gov. Bryant invited Trump to the museum's opening. Lewis and Thompson of Mississippi said it's an insult for Trump to come given his response to white nationalist rallies and other racially divisive comments. The White House issued a statement saying it's "unfortunate" that Lewis and Thompson won't join the president in honoring the "incredible sacrifice civil rights leaders made to right the injustices in our history." Bryant rejected calls to revoke the president's invitation. "The president of the United States should be able, and we're very thankful that he is going to come for this historic occasion," Bryant said. He said Trump would honor Mississippi with his presence. Dennis Dahmer disagrees. He said that Trump's attendance takes away from the seriousness of the moment and that some members of his family said they would not attend the museum dedication because they feel it's now tainted.